I had never heard of Brookies until my kids spotted them in the fresh-baked section at our Wegmans grocery store. Turns out this delightful little dessert is a chocolate chip cookie (on the bottom) and brownie bar (on top). While I had to agree that this treat was to die for, at the same time my head ached as I envisioned all of the processed sugar and gluten that my kids were consuming. So my next challenge lay before me. 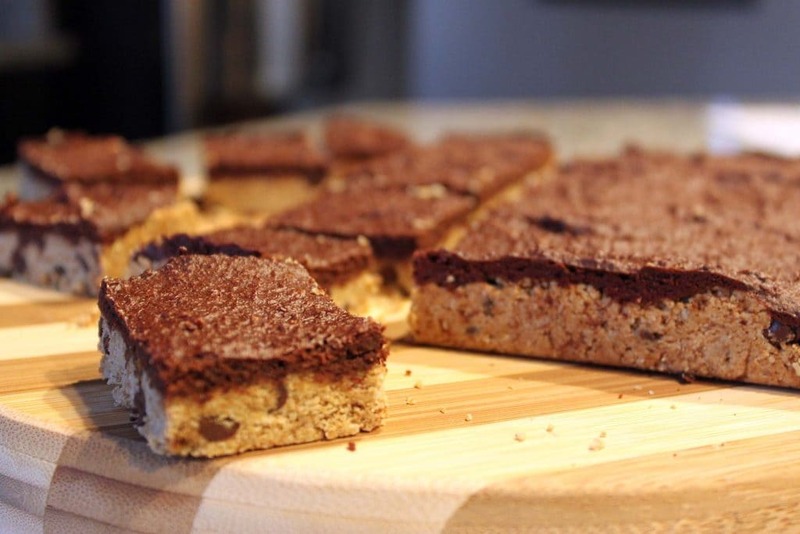 . . creating a Brookie recipe that would eliminate the processed sugar and gluten, add in some plant-based protein, and most importantly rival the bakery Brookie in texture and flavor! After several iterations (which made my kitchen look like a war zone), I achieved success! I used almond flour and gluten-free oat flour to eliminate the gluten while packing in some plant-based protein at the same time. 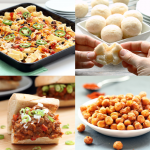 Neither parts of the recipe have any animal-based products so they are dairy-free (and vegan). Maple syrup, coconut nectar and coconut palm sugar replace the conventional sugar making them free of processed or refined sugar. Because the recipe has two parts, it may appear complicated, but it is not. In 40 minutes (25 minutes of prep and 15 minutes of baking time) you will have a nice warm pan of delicious Brookies sitting before you! 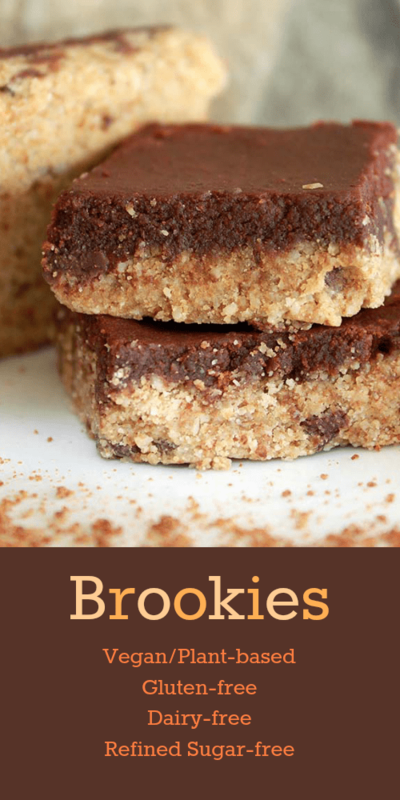 Now on Nutritionicity, a nut-free version of the Brookie – Allergy Friendly Brookie including a printable recipe card! 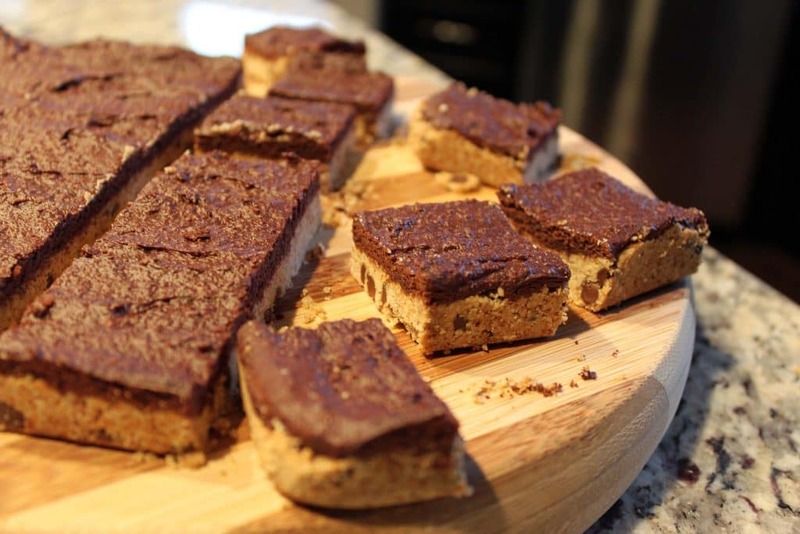 Or for something a little different, try my Vegan Brookie No-Bake Cheesecake recipe! (1) Preheat oven to 350 degrees Fahrenheit. 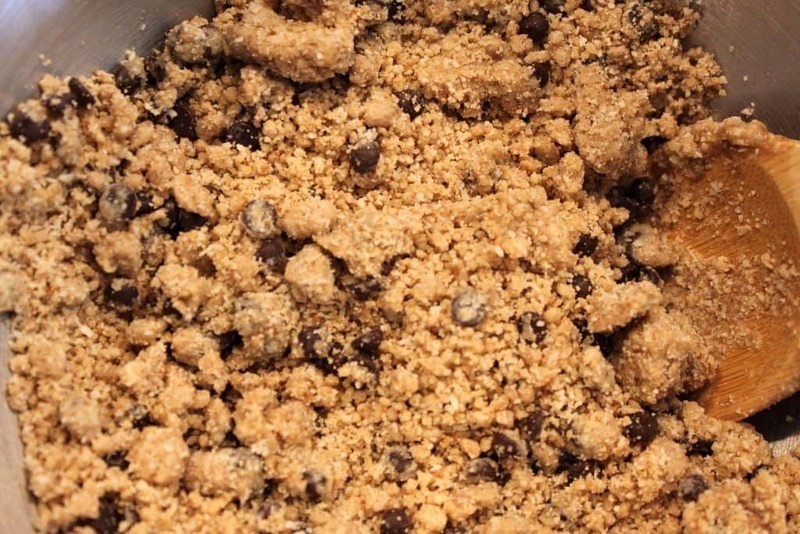 In a medium bowl combine all dry ingredients (almond flour, gf oat flour, mini vegan chocolate chips, coconut palm sugar, baking soda and sea salt). Mix well. 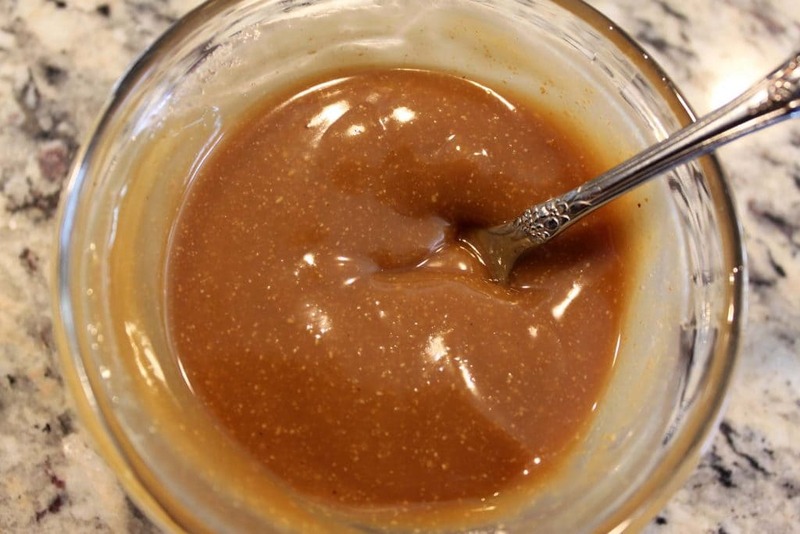 (2) In a small bowl melt together nut butter and coconut oil. I did this for 45 seconds in the microwave on medium-low power. If you don’t have a microwave you can use a small sauce pan on the stove. (3) Add coconut nectar and vanilla to melted cashew butter and coconut oil. (5) Mix wet ingredients into dry. 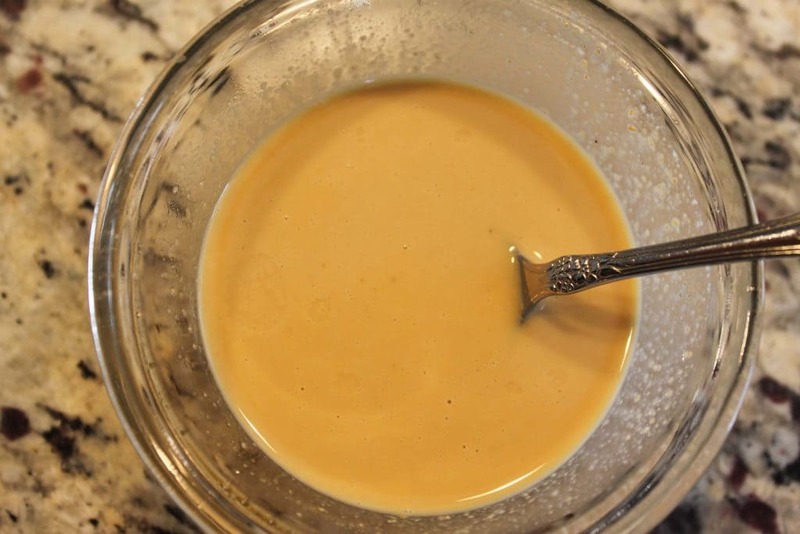 If you are experiencing difficulty getting the ingredients to mix well use a slicing motion with your spoon and cut the ingredients together like you would if making a pie crust. 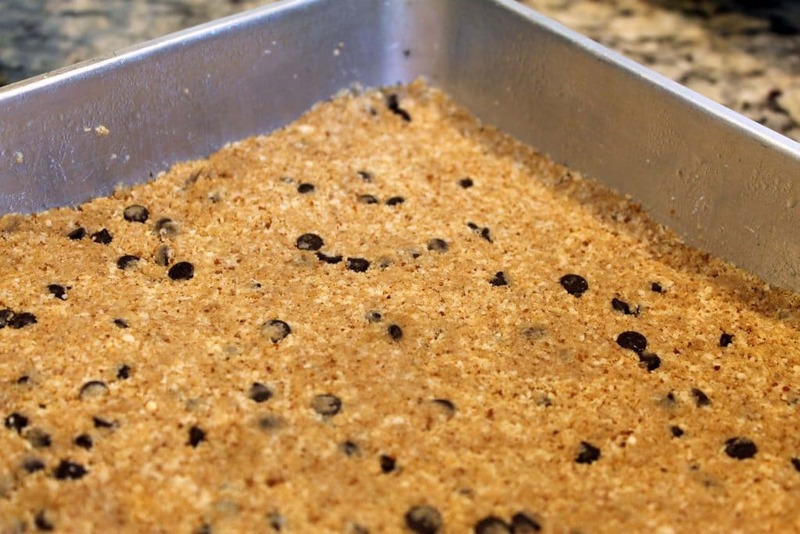 (6) The combined mix will be dry and crumbly like a graham cracker crust. It is ready to press into the pan if it holds together when you take a finger-full and press into a ball. 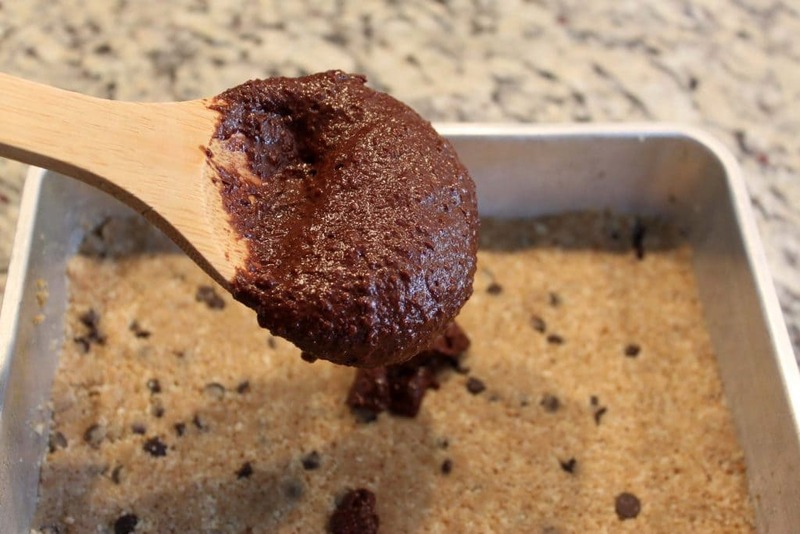 (7) Firmly press mixture into a greased 8×8″ pan (as you would a graham cracker crust). 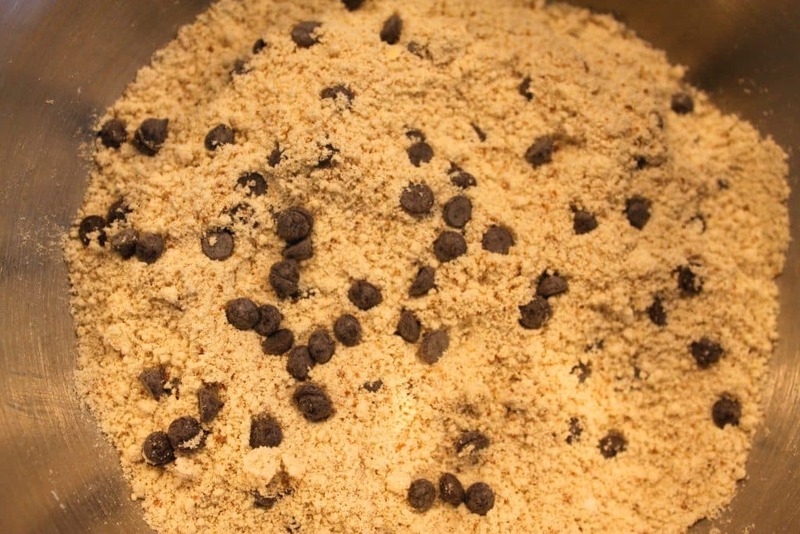 (1) In a medium bowl combine all dry ingredients (almond flour, gf oat flour, cocoa powder, and salt). Mix well. (2) Melt coconut oil and mix well with dry ingredients. This will form a loose chocolate paste. (3) In a small bowl whisk together coconut nectar, nut milk and vanilla. 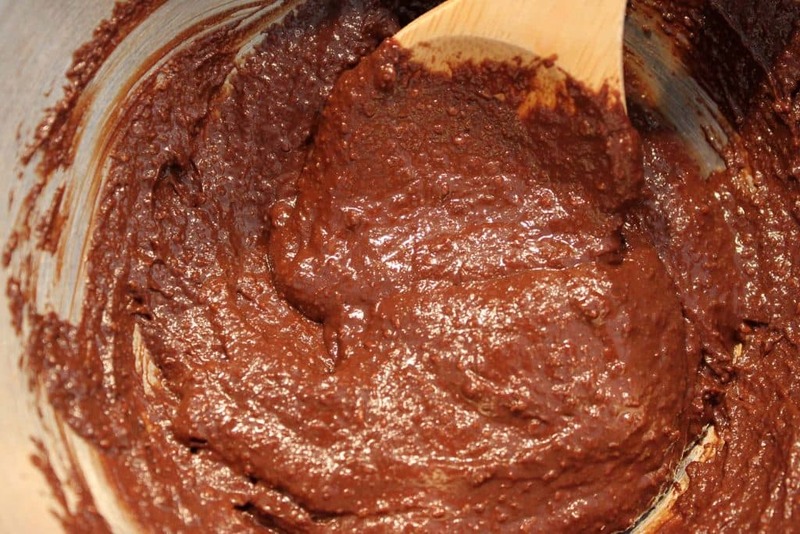 Add to chocolate paste and mix well. 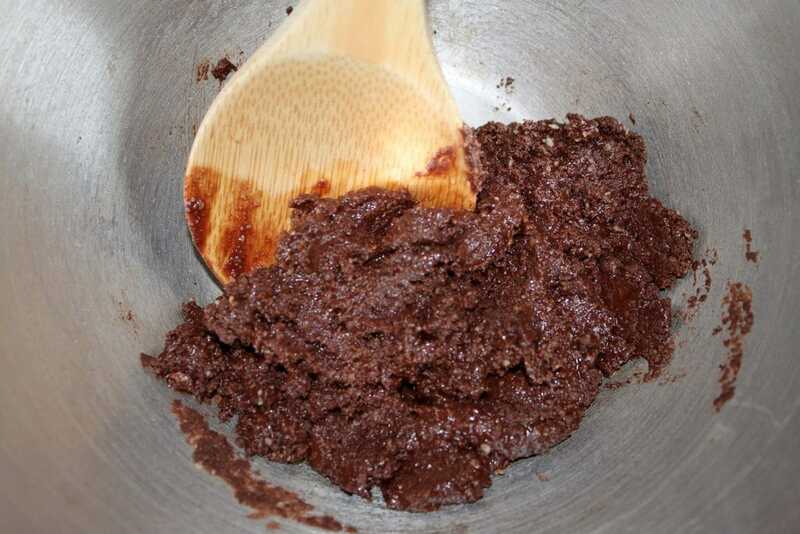 (4) Combine coconut nectar mixture with chocolate mixture and stir well. 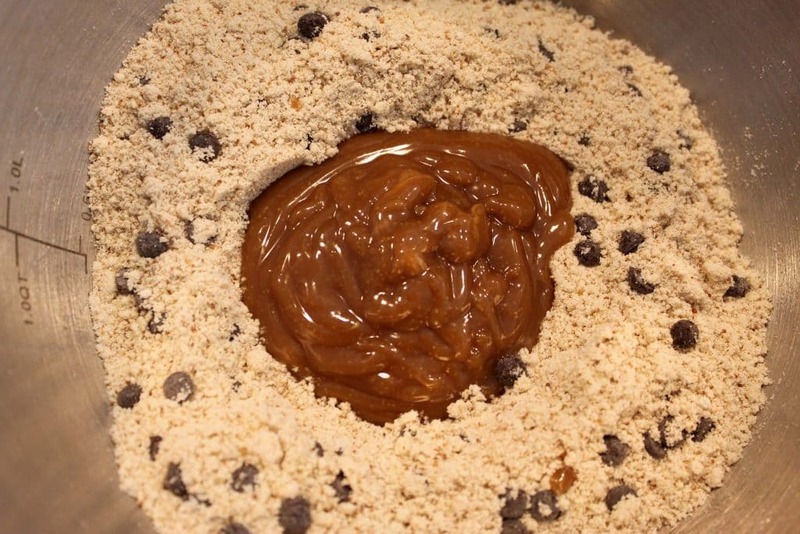 (5) Pour combined mixture onto chocolate chip cookie base and spread evenly. (6) Bake at 350 degrees Fahrenheit for about 15 minutes. You can test doneness with a toothpick or by lightly touching the brownie surface. Let cool for approximately 30 minutes. The Brookies can then be cut. I am so happy with the final product of my Brookie mission. 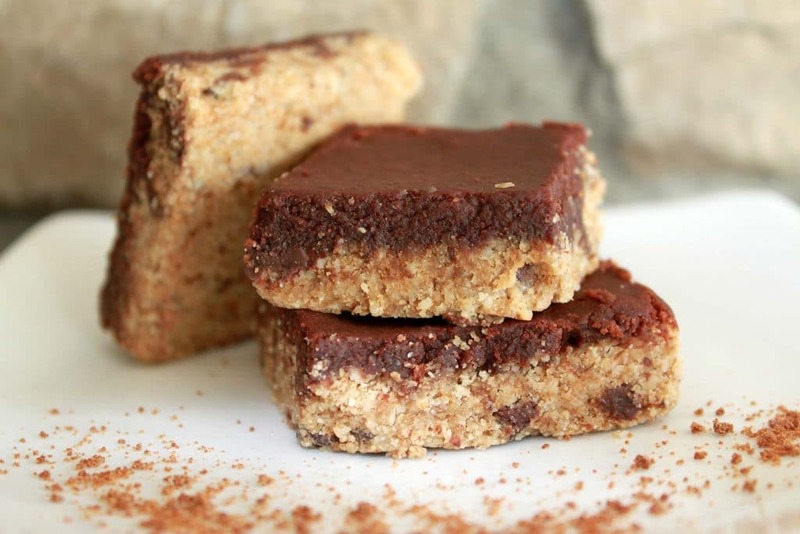 These tasty bars are delicious, nutritious, and something you can feel good about treating yourself to. The flavor is even better than those made in the store bakery (even my kids prefer these over the store bakery versions). 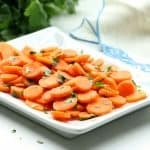 Eliminating the refined ingredients gives them a flavor that tastes fresh and unprocessed. Enjoy! 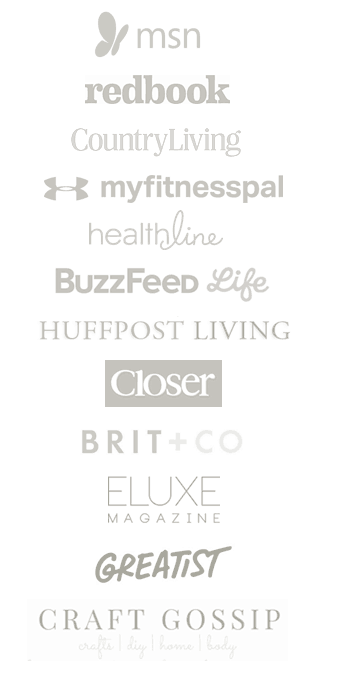 And don’t forget to like us on Facebook and follow us on Instagram and Bloglovin‘ for the latest updates. Follow us on Twitter for cutting-edge news articles about nutrition and health, and Pinterest, where we have all sorts of fun stuff! I’ve never heard of oat flour, seems like a dumb question, but what is it? Hi, Can we use Dairy milk for this recipe? I cannot have coconut. 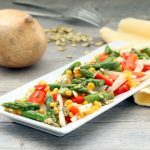 (makes it hard(er) to be a healthy vegan!) Is there a sub for the oil you would recommend? Could you use just regular gluten free flour instead if the almond flour? Just made these!!!!!!!!! They’re sooooooo delicious!!!!!!!! Mahalo!!!!!!! (: (: (: (: OMG I just took another bite. They’re so good. I didn’t believe you when you said that the flavor is better than the “real” kind, but they are!!!!!!! I am new to the refined sugar free challenge in my life and I was curious if those chocolate chips were considered refined sugar free? I know they have evaporated cane juice, so wasn’t sure. I hope so because I got soooo excited when I found this recipe! I’m dying for a treat like this! Hey Jana, Thanks for the great recipe! My wife & I made them tonight. Excellent! Subbed almond butter for cashew, reduced agave to 2T + 10 drops Stevia in 1T water. Will be making these again! Thanks for posting! Can’t wait to try these, I have a coeliac vegan to cater for and it feels good to find something we’ll both enjoy. Thanks! 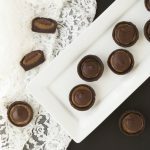 I just made these delish little treats, so easy and so tasty! Wonderful recipe. 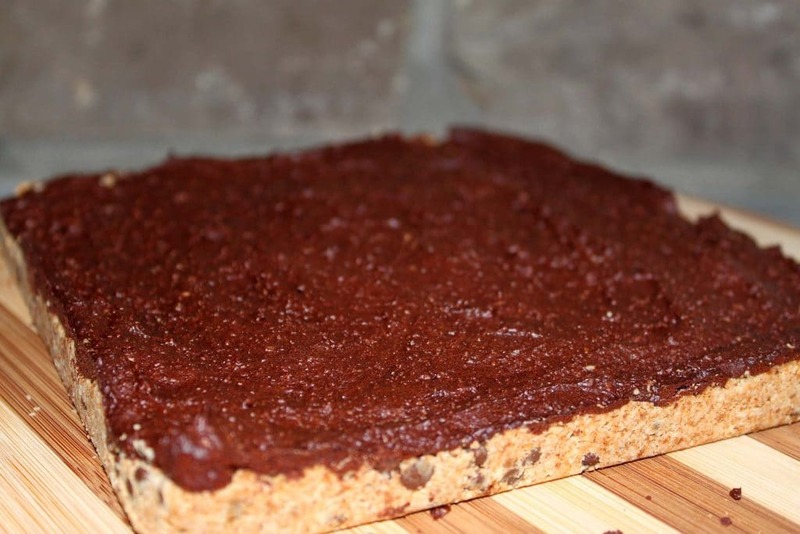 I used a blackbean brownie recipe for the top to add some extra plant protein – very very yummy! This looks so yummy and I’m going to try it, but I was surprised to see agave being used. Now there are reports that agave is worse for you than high fructose corn syrup. Is there any reason not to use maple syrup instead in this recipe? Thanks! In case you’re interested, I found info on agave here..
Hi Joanne, Thanks so much, I’m glad you like the Brookies! This recipe is over a year old and probably one of the last I used agave in for the very reasons you stated. Coincidentally, the Dr. Weil article you cite is one of the first that I read some time ago about the new research findings on agave. 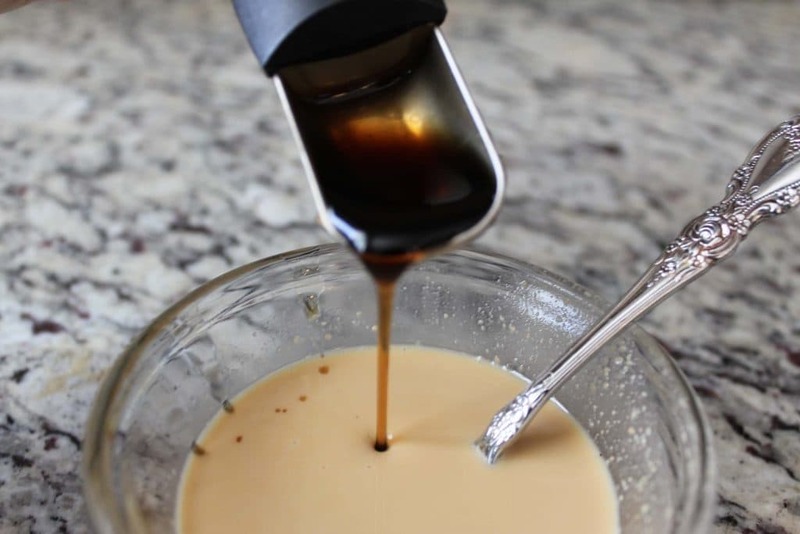 🙂 I have used either maple syrup or coconut nectar in most of my recipes utilizing a liquid sweetener for a while now. While coconut nectar does contain some fructose, most research substantiates it as having much less than agave. One of my “to-do” items for the future is to identify my recipes that use agave and offer suggestions for replacements. In the brownie portion of the Brookie you could definitely substitute maple syrup from a baking perspective. If you prefer a more neutral flavor from your sweetener in the brownie (as the maple syrup does offer its own flavor), I would suggest using the coconut nectar. I have been very happy with the results I have received from it since eliminating agave. Thanks for sharing, enjoy the Brookies!! I will try for sure! Thank you. Looks amazing!! Definitely try soon! I don’t think anything is too much work for a brookie! Love the sound of the nut-free version too, thanks for that! Thanks so much Deryn! I hope you enjoy them too!! 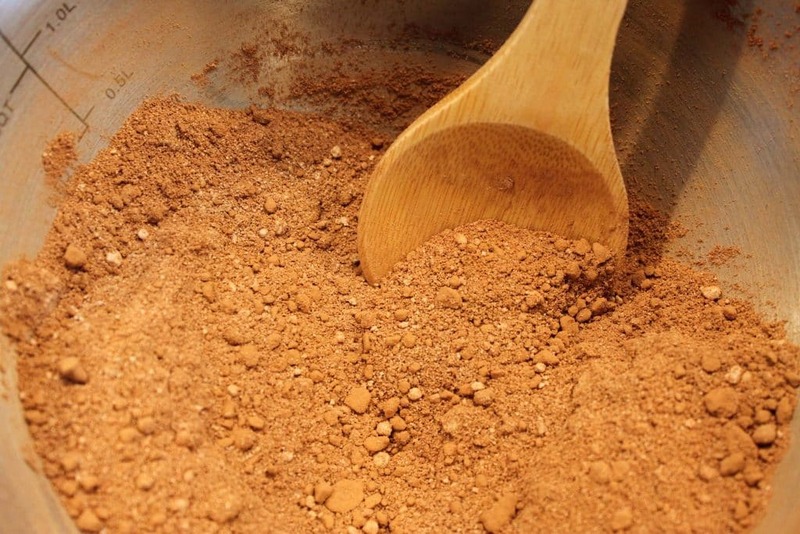 Would I be able to use raw cacao powder instead of cocoa powder? Wow! 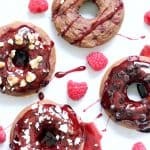 These look incredible and I love all the ingredients! I’ve never left a comment before on a recipe, but these Brookies were so amazing and so healthy that I can’t help but comment! They tasted even better once they sat in the fridge over night. My husband and my 3 children also loved them! I did replace the cocoa powder with Vega’s Chocolate Protein, but other than that, I pretty much followed the recipe. Good job! Hi Natasha, Thanks!! I’m honored that you picked me for your first comment 🙂 That’s a great idea substituting the Vega Chocolate Protein Powder for some extra protein. I’ll definitely have to try that. I am a big fan of Vega’s protein powder products! Glad to hear it was a hit with your whole family. Thanks again! hi Jana…i made your allergy friendly version today…they turned out lovely but the cookie part was a bit dry and crumbly…do you think i can add an egg or maybe more butter to make it more like a cookie? I love the low sugar content of these! They look amazing! These look fabulous! I can’t believe I’ve never made brookies. Do you recommend buying almond flour or can I use homemade almond meal (slightly coarser than the flour)? I know some recipes do better with store bought flour v. homemade. Thanks! Hi Robin, Thanks so much! I totally agree. There are some recipes that I prefer the courser almond meal/flour in as the “chew” it gives adds a nice dimension to the product. In this case though I would definitely recommend using a finer almond meal/flour. I hope you like them!! These look so good. Where is the printer friendly version of this recipe? These look great! I am always on a quest to make yummy food that is more plant-based and refined sugar free. 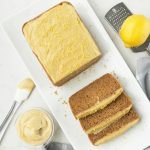 Since my son has a severe nut allergy, do you think it would work for me to substitute a different flour for the almond flour, and sunflower seed butter for the cashew butter? Do you have any recommendations? Thanks! 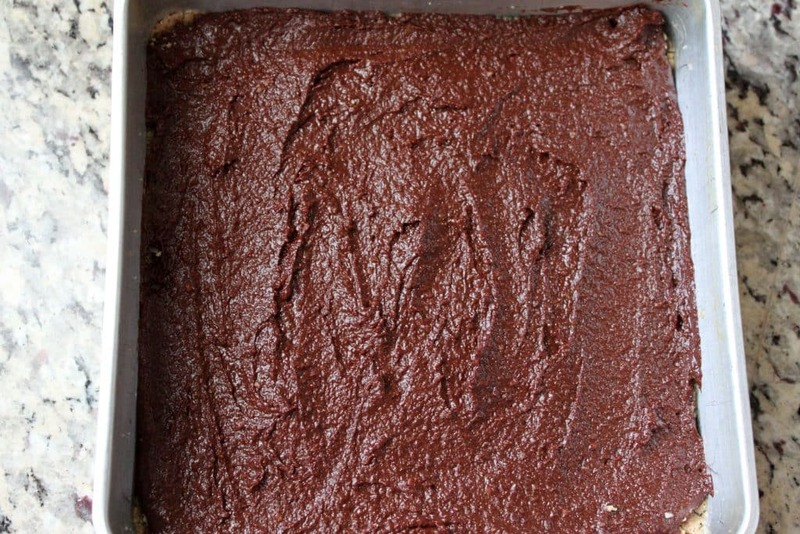 Does cashew butter offer something that almond butter won’t? Just curious bc I’m going to make these and I have almond butter on hand but no cashew butter. I made it with crunchy salted almond butter (the only thing I had on hand) and skipped the additional salt. I also had to sub light brown cane sugar for the palm sugar and sub honey for the agave. Turned out GREAT! Very sweet, rich and decadent, so that will keep me from devouring the entire tray in one sitting. Thank you!! Is there a sub for the oat flour? Hi, Holli! If gluten-free oat flour is not an option for your diet, I would recommend substituting white rice flour for the gf oat flour. I have not actually tried this substitution in this recipe, but am pretty confident that it would be a success! I don’t eat oats either, I usually sub in rye flakes (in this case I stuck them in my food processor to make flour) in baking recipes. It works for my chocolate chip “oatmeal” cookies so I’m assuming it will work here.